The market of glycerine is quite a curious case as the supply is totally independent of demand but instead linked to biodiesel production. It results in periods of severe shortages and ample oversupply. With the lack of stability on the biodiesel market and continuous demand growth for this by-product in the developing countries, what lies in store for glycerine? Glycerine, also known as glycerol, is a water-soluble liquid with sweet taste. It is colourless, odourless and viscous. It is a by-product of two independent processes: hydrolysis and transesterification. The former is used for soap and fatty acid production while the latter is the process in which biodiesel is produced. The usual production rate is 10% of glycerine per unit of biodiesel. What comes out of the transesterification process is, so called, crude glycerine with 40-90% of glycerine content. This by-product is then refined to increase the content of glycerine to 99.5% or 99.7%. There are three grades of refined glycerine on the market: technical one, used in the production of chemicals but not intended for human consumption, USP (United States Pharmacopeia) grade which is suitable for use in food or pharmaceuticals and Kosher grade glycerine, coming from plant oil sources and thus suitable for kosher food production. 2004 is a turning point for the glycerine market due to the, so called, “first biodiesel revolution.” Since that time, together with the fast development of the biodiesel industry, the esterification process became the main source for glycerine. Today, around 66% of world’s glycerine supply comes from biodiesel production. Before 2004 the main source of glycerine was hydrolysis used for soap and fatty acid production. The year 2010 brought what we call the “second biodiesel revolution,” which popularized waste-based biodiesel. Yet, it also influenced the quality of the crude glycerine available on the market as both the nature of raw material used in biodiesel production as well as the catalyst for the esterification process have impact on the purity of glycerol. Typically, the by-product of the waste-based biodiesel production has lower quality with glycerol content between 60-75%. However, today, there is a number of UCOME and TME plants whose by-product has 80% glycerol content. Due to the rapid development of the biodiesel market, the production volume of glycerine more than doubled during the last 10 years causing misbalances between supply and demand. More glycerine was produced than the market could absorb and there was an urgent need for new uses for this by-product. However, with the growing number of possible applications, the demand for glycerine started to go up, outgrowing, in the last few months, the current supply. Moreover, the improvement in the life standard in certain regions of the world, especially in the South-East Asia, continuously increases the demand for glycerine. In China and India the ever growing demand for medicines and personal care products is putting pressure on the refined glycerine market. The main characteristic of the glycerine market is the lack of interdependence between supply and demand. As glycerine is a by-product, its supply is mainly dependent on the performance of the biodiesel market. Thus, bigger demand for glycerine does not result in bigger supply The supply increases only when the demand for biodiesel goes up. As a result, the price of crude glycerine is strongly dependent on the current supply levels making the market very volatile. Historically the price of glycerine was always low due to oversupply, however, with the discovery of new applications and expansion of the market, the demand started to grow allowing the prices to recover. Currently, the demand from developed countries as well as from developing regions, especially, South-East Asia is pushing the prices further up. It is difficult to predict whether the growth of the biodiesel market will go hand in hand with the increase of glycerine demand. It makes it even more difficult to forecast what will be the development of the price trend in the short term, let alone in the long term perspective. What is sure, though, is that it will be determined by the situation on the biodiesel market, predominantly in Europe and in Asia. It is estimated that the current worldwide production of glycerine is 2.9 million tons per year. This estimation takes into account all possible sources. In 2015 in Europe, around 810,000 tons of glycerin has been produced from veg-oils and around 150,000 tons of glycerine has come from the UCOME and waste fatty acid biodiesel production. In addition, another 45,000 MT should come from processing animal fats of category 1 and 2 into biodiesel. However, it has to be noted that glycerol originating from waste-based biodiesel production can only be used for technical purposes and cannot undergo the refining process to USB grade, only to technical grade. 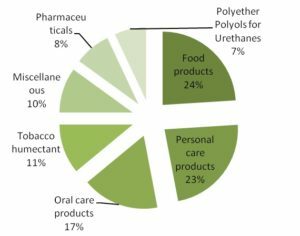 The size of the refined glycerine market is estimated at 2 million metric tons in 2015 but it is growing rapidly as pharmaceuticals and personal care are the fastest growing demand sectors. More than 55% of the world’s demand for crude glycerine comes from two regions: Europe and South-East Asia. While Europe is the biggest buyer of crude glycerine, Asia is the biggest producer and consumer of refined glycerine, using approximately 35% of world’s supply. Europe consumes 28% of refined glycerine produced annually in the world and North America around 19%. Even though the glycerine market is small, compared to the biodiesel market, for example, it is global and interconnected making it vulnerable to shocks in international biodiesel production. Next to Europe and North America, the countries of South-East Asia are the key players on today’s glycerine market. The interest comes predominantly from China and India where the rapidly changing economies contribute to a steady increase in the standard of living. This, in turn, influences the growth of demand for personal care products and medicines which are produced with the use of refined glycerine. Thus the demand for glycerine is increasing but the local supply cannot keep up. South-East Asian countries usually import crude glycerine and refine it locally as most of the glycerine consumed in this region is refined. In 2014, China imported 795,000 MT of crude glycerine and 164,000 MT of refined glycerine. At the same time, export reached mere 3,550 MT of refined product. The imported volumes increased by 30% between 2013 and 2014. Last year, the total consumption of refined glycerine in China accounted for 918,000 MT and is predicted to grow further in 2015. The glycerine imported to Asia comes mainly from European and Argentinean biodiesel producers while 60-70% of the local supply is also a by-product of the esterification process. Due to recent changes in the Indonesian biodiesel policy introducing subsidies for biodiesel producers, the country might become an interesting glycerine supplier for China or India. It is difficult, though, to estimate the possible volumes that might be added to the market as a result of these legislation changes. Definitely, this will not be enough to satiate the ever growing demand for glycerine in this rapidly developing part of the world. The world glycerine market keeps growing in two separate directions. First of all, new applications for glycerol are constantly being invented, making it a highly desired product: currently the number of glycerine uses reaches 2,000. Secondly, new geographical markets for glycerol appear due to the fact that new developing countries experience improvement in life standards of their citizens. As a result, the demand for products including glycerine is increasing. It is estimated that the total growth of the glycerine market between 2011 and 2018 should account for 6.3%. The key question that remains is whether the supply will keep up with the increasing need for glycerine given its independence from demand. This will be determined solely by the development of the biodiesel industry and the legislative support for biodiesel production in countries that are new to this industry. It is also interesting to note that the popularization of HVO will not help to ease the situation on the glycerine market as the production process of green diesel does not result in glycerol as by-product. Thus, if the biodiesel mandates do not increase in the future HVO production might even have a negative impact on the glycerine market. It is connected with the promotion of waste-based biofuels at the expense of first generation biodiesel production. However, with the HVO sector constituting still a relatively small percentage of the regular biodiesel market, this should not be considered as a realistic threat for the glycerine supply, at least in the next few years. The forecasted development of the biodiesel production in Asia or Argentina should help to balance the supply and demand on the glycerine market in the future. At the same time, it should contribute to the further expansion of the personal care and pharmaceutical uses of glycerol and the availability of such products in the developing regions.